Don't you think Mobility is revolutionizing education? A few years ago, smartphones were considered a subject of concern when it came to students future and career. Relax! the scenario is not the same. Over the past few decades, the influence of technology showcase immense outrage in the learning industry. E-learning mobile app encourages maximum efficiency and effectiveness, to educators and students alike. One of the recent surveys states that educational apps more popular among kids between age group 5 to 10. In fact, nowadays, teachers are encouraging children to use mobile learning apps. With them learning app enhancing skills and overall competence level is at the peak. Needless to say, the use of mobile learning applications has grown immensely over the last few years. At present, Apple App Store is whopping 65200 educational apps for iPhone and iPad users, which backs 8.47 percent of all apps. This clearly suggests apps have made their way to education. Listed below are some of the benefits of mobile apps in education. Mobile learning apps create an interesting learning atmosphere. It enables children to secure better grades, strengthening imparting skills to execute assignments and other related activities with precision. In case of any problem, with any subject, you can search it on the app, and without any time delay solution is available on the fingertip. Either an advance class-preparation or test time, this boost students confidence to a great extent. The eLearning apps enable kids to utilize their leisure hours in exploring productive things and arouse curiosity to learn more. For example, games like puzzle, sudoku, number games, and etc activities makes kids brain sharp. Too much engagement on television or taking can spoil the child. Moreover, M- learning apps comes as a good alternative to wasteful internet browsing. As we know, technology is transforming at a rapid pace, it’s highly mandatory for kids to take interest in technology. The Edison Research, conducted during 2009 to 2014 clearly showed the number of smartphone users below the age of 18 increased by 600%. This number has consistently increased over the years. The use of mobile applications in education smoothen the process of learning making it interesting, interactive and fun. These mobile applications boosted with entertainment quotient engage students in the activity. For example; introducing gamification into the mobile applications has made it easy to attract kids. The scores, badges, and goals to achieve excite students. In an experiment, two renowned professors of Winona State University’s ComTim Gregg-Harrisn and Nicole Anderson puter Science’s Department, used gamification while teaching mathematics to attract students. This concluded students found it more interesting and were motivated towards learning without much effort. It’s difficult for teachers to engage each and every student with what is being taught. This can hamper child's interest. However, when a student is using an app the complete interaction time is their own. They can learn the way they want and utilized the time accordingly. 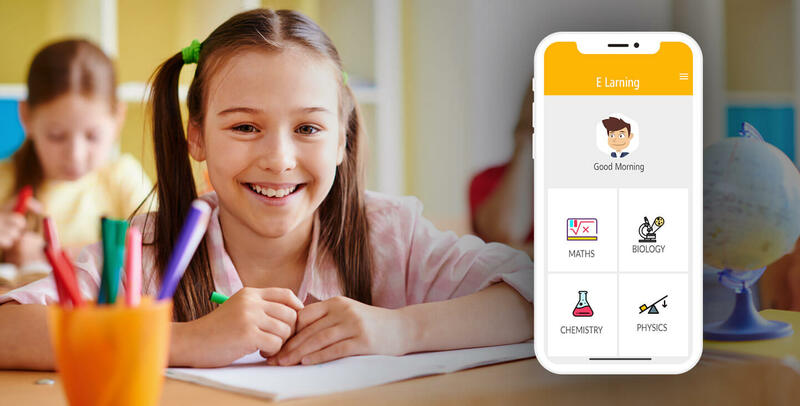 As the educational platform is coupled with technology, the teachers are now allowing students to use m-learning apps and create new and interesting projects. Now, net surfing encourages the kids and students to deliver the better result. Today, with the help of apps student can demonstrate any topic or project creating a unique video. Moreover, lecturers save the time of students by presenting short videos, and this helps to make students more creative. Apps are available for different types of skill levels and encouraging learning using a variety of teaching methods like Q and A’s, video tutorials and even educational games. Interactive education apps are great for stimulating the kid’s mind. It’s not wrong to address apps as the fresh and innovative way to teach an enthusiastic learner. Keeping teaching unique and interesting is a crucial aspect to engaged students, and to achieve the same learning apps comes as the fantastic platform.